If you’re fed up with constantly having to dig up weeds from your garden, you might want to consider using weed barrier fabric. It’s not suitable for all situations, but our guide will tell you where and how to use it. Don’t think you can lay down weed fabric on your whole garden and never have to do any weeding again – I’m afraid it doesn’t work like that! Although it can be used in planting areas. Places that are perfect for using weed fabric are areas where you don’t need to pierce it at all – under decking, pathways and such like. 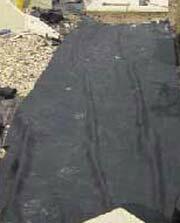 Don’t even think about using weed fabric on a standard flower bed where you will be planting annuals and perenniels. You’d need to make so many holes to plant things in it, that it really wouldn’t be worth having. Strawberry patches are great places to use weed fabric – as well as keeping weeds down, it helps to control slugs and snails. You can even buy fabric that’s been impregnated with copper, which will keep slugs and snails away for sure. Shrubberies are good places to use weed fabric – areas where there are relatively few plants with good spacing. As the shrubs grow larger you may not even need to replace the fabric in years to come. Ornamental gravel gardens are another ideal place to use weed fabric – a few specimen plants can be planted through it, without needing to make too many holes. A lot of gardeners are quite dismissive of weed fabric, also known as landscaping fabric. There is the argument that although it stops weeds taking hold, it also stops leaf mulch and other goodness getting down into the soil, providing much-needed nutrients. You can reduce the negative effects of weed fabric by making sure you buy a good-quality fabric type rather than being tempted by the much cheaper black plastic versions that are on sale. If you give in and buy the nasty black plastic version, you are creating a barrier which stops not only weeds, but also water, air and all nutrients from getting into the soil. It also tears very easily, doesn’t last long and looks unsightly. Even the best fabric will only last for about 10 years, at which point it will start to degrade, so you have to be prepared to replace it – not an easy job. As you won’t be able to get at the ground once the weed fabric is down, it is important to prepare it as well as you can before laying the fabric. If you are laying the fabric under decking or a pathway, then it is a matter of removing all plant life from the area and making sure it is completely flat. A systematic weed-killer such as glyphosphate will do the job of killing off any existing weeds before you start. If you are creating a new planting area where you are going to use the fabric, then you’ll need to dig it over well, making sure to remove all weeds (including roots that could grow back such as bindweed, couch grass and nettles), and dig in plenty of organic matter that will release nutrients into the soil. Again, you could use a weed killer rather than weeding by hand, allowing plenty of time for it to take full effect. You will still need to dig the area over though. Remove any sticks and stones that could rip or tear the weed fabric, firm down the earth and rake over the area until you have a smooth finish. If you are adding weed fabric to an area where you already have plants in place, carefully spray any weeds, making sure not to get any weed killer on your plants, and remove by hand any that are too close to the plants to spray. Rake over the ground around the plants and make sure there are no sharp stones or sticks that could puncture the weed fabric. Weed fabric usually comes on a roll, so you’ll need to figure out the best way to cut and lay it to fit the area you are covering. A sharp pair of scissors is the best thing to use for cutting the fabric with. Roll out the fabric and allow for about an inch of overlap where two pieces of fabric meet. When it comes to the edges, cut the fabric to fit the area you are covering, then secure it in place. You can use landscape staples to pin it in place, or a decorative edge of rocks if you prefer. You will be putting a layer of bark, mulch or gravel on top of the fabric so it’s good to have something around the edge to keep it in place. If you are laying the fabric around existing plants, cut a slit into the fabric from the closest edge and slide it into place around the main stem of the plant. You can cut a larger hole if necessary to make sure there is no pressure on the plant. If you are adding plants after laying the fabric, set out your plants where you want to position them, then for each plant take a sharp craft knife and cut a ‘X’ into the fabric. Make it just large enough to fit the plant into. Tuck the flaps back and dig a hole using a hand trowel. Put your plant in as normal, adding compost as needed. When you’ve finished, make sure the flaps of fabric are on the top, and lay them flat so that they meet up again. When you place your mulch or chosen covering around the plant it will hold the fabric in place. Once you’ve got your fabric and plants in place, cover the fabric with a good layer of bark, mulch or decorative gravel – whatever material you’ve chosen to keep the area looking nice. You’ll still need to weed occasionally, but you will be able to pull the weeds easily by hand as they won’t have a chance to get their roots in beyond the top layer.